"As illustrated in Pilger aus Palembang (Hurgronje), the clothing of the Sumatran pilgrims lacks the color and patterns expected." "The clothing of the Sumatran pilgrims (see figure 1) lacks the color and patterns expected." Fig. #. Descriptive title or caption, from Image Creator’s First Name Last Name; Description or Title of Image; Title of the website where the image is located; Publisher or sponsor of the site; Date of Creation; Medium of publication (“Web”); Date of access. Fig. 1. Digitized black and white photograph showing four pilgrims from Palembang, the capital city of South Sumatra, Indonesia, from Christiaan Snouck Hurgronje; Pilger aus Palembang [Pilgrims from Palenbang]; The New York Public Library Digital Collections; The New York Public Library; 1888-1889; Web; 18 March 2016. Creator's last name, first name. Title of Image or Description of image. Year of creation. Gallery or museum where the image is physically located. Title of the Website or Database. Medium of publication ("Web"). Date of access (Day Month (abbreviated) Year). <URL>. Hurgronje, Christiaan Snouck. Pilger aus Palembang [Pilgrims from Palembang]. 1888-1889. The New York Public Library Rare Book Collection. The New York Public Library Digital Collections. Web. 18 March 2016. <http://digitalcollections.nypl.org/items/510d47dc-47cb-a3d9-e040-e00a18064a99>. "As illustrated in Pilger aus Palembang (Hurgronje, 1888-1889), the clothing of the Sumatran pilgrims lacks the color and patterns expected." Figure #. Descriptive caption of image. From Image title, by Creator’s Name, Year of creation, Database/URL. Copyright Date by Name of Copyright Holder. Reprinted with permission (if applicable). Figure 1. Black and white photograph of four pilgrims from Palembang, South Sumatra, Indonesia. From Pilger aus Palembang [Pilgrims from Palembang] by C.S. Hurgronje, 1888-1889, New York Public Library Digital Collections, http://digitalcollections.nypl.org/items/510d47dc-47cb-a3d9-e040-e00a18064a99. In the Public Domain. "The clothing of the Sumatran pilgrims in Pilger aus Palembang1 lacks the color and patterns expected." 1. Firstname Lastname of Creator, Title of Work, date of its creation, the name of the institution that houses it (if applicable), name of database OR image URL. 1. 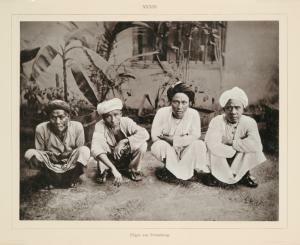 Christiaan Snouck Hurgronje, Pilger aus Palembang [Pilgrims from Palembang], 1888-1889, The New York Public Library Rare Book Collection, http://digitalcollections.nypl.org/items/510d47dc-47cb-a3d9-e040-e00a18064a99. "The clothing of the Sumatran pilgrims (see fig. 1) lacks the color and patterns expected." Figure #. Descriptive title or caption. Copyright statement. Creator’s First Name Last Name, Title of work, Date of Creation, in Name of website or database, URL. Figure 1. Photograph of pilgrims. Public domain. Christiaan Snouck Hurgronje, Pilgrims aus Palembang [Pilgrims from Palenbang], 1888-1889, in The New York Public Library Digital Collections, http://digitalcollections.nypl.org/items/510d47dc-47cb-a3d9-e040-e00a18064a99. Visual sources are cited in the notes ONLY, not in the bibliography.